TROUT OPENER IS HERE! We are entering the dragon of possibility when it comes to engaging our favorite species… THE BROWN TROUT! Though we target and fish browns throughout the year, it’s the trout opener that allows many bodies of water to be fished that are closed the other half of the year here in the great state of Michigan, and then again, those techniques that would lie dormant till the windows of hatching bugs and terrestrials offer the dry fly options we are so fond of. Here on the PM we have so much going on right now in as far as venues of potential fishing… So much so, it’s hard to believe I’m here at the house writing this. 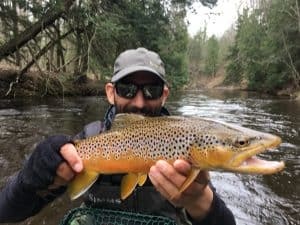 We have some great openings still available this May & June for our finest Mayfly hatches, which do include the Gray Drakes & Hex Hatch… Also, mouse fishing for many has already started up and has taken over as my highest addiction while angling for copper, and will last till early October as of now. Hendrickson, Black Caddis, Olive Stone, and even Olives on the cloudy days are all in play right now… Nymphing pays when nothing else will, but streamers still own the river till the clarity is ginned out a bit, especially when factoring in the Salmon Fry Hatch going on strong right now. Steelhead are still about and giving up the last of the spring caviar; and in those areas where they are getting it on, there will be quite the audience of gold following that protein roll as the fewer the count of eggs in the stream, the more value each one is worth. 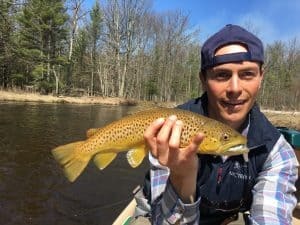 No matter what your fancy of fly fishing, its all in play right now and I would encourage all of you to give us a call and get some good summer dates in the book for the up and coming 2017 Trout Season here in northern Michigan, including the Dark Side options that are a GO as of now! Streamers right now are running the show, in such an array of size, color, and swim… But all seem to get some attention per the Salmon Fry Hatch that is in FULL swing right now. Arguably the spring streamer season is our finest for not only numbers of fish brought into play via all the fry keeping the chase motivation strong, but also our bigger fish streamer season as it applies to the overall size potential of our fisheries since the water color keeps so many recluse and larger fish out on the prowl with the lights on versus off. Best colors going right now are “SHAT”, black, and white… Though when the clouds are deep enough, the yellow plays well. Olive has it’s moments, but is more of a clear water option for me… With ginger showing its teeth very nicely early on in March through the first week of April. Lead headed anythings, (as they seemingly all move the same), are loosing the cool water traction they had with the warming of spring; now it seems as if the swim flies will own the show till winter shows itself again. Steelhead are frequently being caught right now via the stripped fly; and it truly is the better avenue for engaging the late season migratory versus snagging them off their beds with Chuck & Dork gear. The fish chase the fly and actually EAT IT versus being impaled by it… Seeing this type of protection or predation allows an angler to see what a steelhead looks like when it truly wants your well tied presentation. We’ve had days where moving up to a dozen of them is common, and we’ve landed up to seven in one pass this spring thanks to the wet towel battles offered by the more or less, spent fish. Most never get pictured since the start of my trout season is the 1st of April and therefore my clients target isn’t the deteriorating chrome, so much as the fired up, and well winter rested, brown trout. Drunk & Disorderly Streamers do run the show in my boat… Not because it’s my fly, but more because there is no fly that moves like a D… With moves like jagger all the way back to the boat provoking more steelhead and brown trout day to day than anything I like to pull out and test it against; This and it’s terribly fun to watch work as is Zarro Spooks! That said, if quality comes second to quantity right now for you, or you’re not able to fish from a moving boat which is how swimming streamers are fished best… Two small fry fished in the eddies right now will pay HUGE numbers of fish as the salmon fry are littered throughout the creek right now and the fish are popping them like Cheeze-Its… Not kidding when I say there are HUNDREDS right now in every slow pinch all the way to the lake and the browns really dig it! 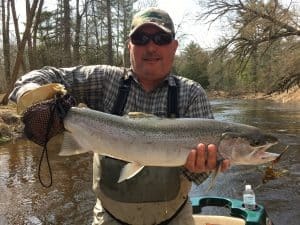 Been fishing the Upper Manistee allot in recent weeks, and doing well to GREAT pending the pesky barometric and trout mood swings. 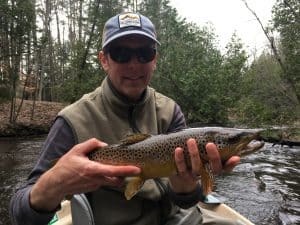 The Muskegon, Manistee, & PM are all in rotation this time of year, and it’s nice to see the green on the hillsides again while driving to these other great watersheds to sample the strip and rip possibilities of each… Streamer fishing will last for another few weeks before really backing off, but the highlight of the season is usually pre hatches, and those have already begun, so get up here soon if you are down with the stripped fly! Dry fly season is here now already… Mother’s Day Caddis are about, Hendrickson pop just after lunch most days, with olives offering opportunity for those brown looking up anytime the clouds keep the sun out of it. Larger Olive stones are coming off with frequency, this just following a solid rotation of the tiny blacks that are still about… Golden stone should start up here in just a couple weeks, and the Gray Drakes will likely be here before that, with this mild and early spring in place. Hex Hatch Dates should be gathered as they always end up filling, and I personally like to take a few days off for myself as I too enjoy the shopping spree of hatches when it arrives. For those looking for a great overall hatch experience, Gray Drakes comes highly recommended as it allows the angler the better part of the afternoon to gather a cast and presentation suitable, allows a window of munch pre hatch, giving the angler a break, then a grand finale of sorts when the hatch goes off and offers such bounty in shortened order; this without the mass of people descending on smaller areas that get choked like the HEX. Last year our biggest on the drakes was 24″, but we broke off a half dozen fish that like to test the tippets as they retreat to the wood… But each night we fished Drakes last year, the fishing was great and we never had shady hatches, this and the lights are on a bit more for my clients that don’t do as well in the dark fishing dries. Offering potential up and down the river, the PM’s entire corridor is game on for Gray Drakes where Hex’s seem to be local to areas instead of river wide. Again, those looking for a great option of fishing beyond nymphs and streamers…. Drakes are a great way to start up your dry fly hatch career! Stones will be in play as soon as the water drops I’m guessing as we had an 80 degree day already and that river heat up will have the ball rolling. Fishing them like hoppers almost, skating LARGE stones in the PM is a great way to get a daytime dandy without falling to the low light spinner falls… Much like the Hendrickson emergences, which I think fish better than the spinners, daytime dry fly fishing is best in MI right now as July & August are more of a terrestrial season. With grass just making it’s 2017 debut, it’ll be a few weeks till the terrestrial game starts showing its potential. Hopper/Terrestrial season is without question the best way for one to improve casting skills and even presentation per the moving boat, rapid fire casting, varied casting angles and types just to suit our tightened corridor… If you’ve been looking to improve your fly fishing cast, all day casting with a terrestrial is that engagement… Better casters will actually tear up the terrestrial scene if they can move the line beyond 35′ from a seated position, but the casting improvements are the real bonus to fishing the terrestrial game since the gear isn’t as strict, and allows a person to cast all day without becoming fatigued. No matter what your dry fly fancy, the next 5 months have you covered for all possible engagements here in Northern Michigan. Nymph & Egg fishing is still very much in play for the trout, and those willing to watch the bob are typically granted a few more fish each day. Right now behind what’s left of the spawning steelhead there are still caviar windows, and those are higher pay off with fewer casts; keeping in mind as the water clears, the game needs to be played. Early on when the water is dirty, high, and tannic, one can almost park on top of the spawners to fish stones and eggs just behind… But now the water is beginning to clear and we are watching the trout spook further and further away. Needed approach and noticing the trout before the first cast is key to converting instead of spooking or allowing an awareness to yourself. Blind spots on fish should be taken into consideration, much like the fall when fishing the salmon eggs behind the fresh water tuna, or each a hatch… Like walking on egg shells, clothing colors factored in, make the first cast the right cast since the water clearing doesn’t allow as many presentations before the fish is savvy. Each time you make a cast that isn’t taken, its like showing your opponent another one of your held cards in poker. You’re only gonna get a few shots before he’s on to your angle and turns away, or just flat ignores you. Whenever possible, approach with caution and stealth so that the first cast you make shows him a set of eggs while he is drunk in the feed; your conversion rate with baffle you if you take these precautions before the first cast, especially when fishing to fish of age and wariness that is often coupled with a sizable reason to drop the anchor quietly, or just walk on those egg shells while on foot. Monitor those lower light windows to better your happenstance, and don’t forget to size down the leader and tippets to sell it. Not only is the water clearing, but the sun is getting higher and when those fish are feeding in a foot or two of water, which is where the late season steelhead will spawn for needed O2 found in the chop… THEY CAN SEE EVERYTHING! 5x won’t be out of the question, and #16 eggs to hide that hook and ensure less potential for lining steelhead as the foam/yarn acts a speed bump for the hook to limit grab save a fish that actually bites down on the pattern. 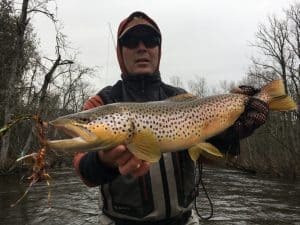 When egging, there are tricks that help keep the fish bumping to a minimum and enhance potential grabs from the brown trout gollies located just behind the happening. Tippets should be short, short when fishing the shallow stuff to better the shot, (which should be blackbird), sink rate, and to actually get your eggs down to the rim of the gravel. Short tippets limit lining steelhead that are bedded and could care less about whatever you’re drifting by; but then again, bring the flies down to shot level quickly instead of floating higher in the column which is less natural considering the brown is looking right at the steelheads caboose. Again, be patient, and look for gravels that are not only holding a spawning pair, but also those gravels that have males teaming behind… This allows the angler to identify that not only is there a hen in place, but she is actively dropping roe since so many males are looking to get in on the action. When there is simply a pair, she is just poised to spawn, or even clearing a spot, but not actually dropping. Once the gravel is hot, she will naturally chum in whatever browns get a whiff of that caviar goodness. These are just a few tips for the egging game that might push you in the right direction… This and by a pair of Costa 580 Silver Mirrors… It truly is like looking up the skirt versus allot of the other glass I own. Just tickled the last week or so not having to dress in layers anymore as those 4 were getting pretty old by the end of March. 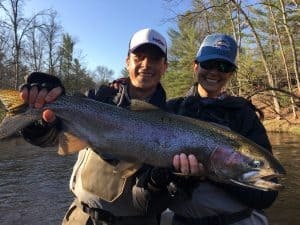 Fishing pressure is backing off nicely with the dwindling steelhead run, and those still around are more looking for a bite with streamers which is great too see. Fry Bite will remain strong for a solid month before backing off and flipping to nocturnal agendas, and for those looking for the better mouse fishing dates… Remember, the darkest nights are the best for fishing, but for learning game and still having some fun… Anything shy of a full moon offers all kinds of after-hours potential with varied practice for the light levels in question. During the higher moon phases, I love running hopper trips well into dark, and early on I love the BIG STONES sometimes till dawn as they love those flying Big Macs. HEX HATCH isn’t to be taken lightly, and though I can get beginners on big ones with mice and drakes, the after-hours dry fly presentation is a force to be reckon with! 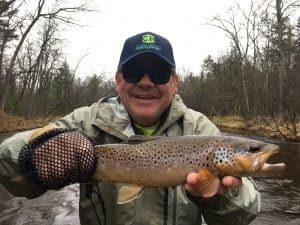 If you are good with a dry fly, and want to try those talents with the Ray Charles approach… I’M GAME… But if this is you first choice for your first hatch, I would say NOT SO MUCH! If you have fished flies of any kind in the dark, and want to try the dry fly approach, this is a good consideration… Even still, if your have never fished in the dark before and want to just go and see a really neat hatch and all the potential around you, without the expectations of landing or even hooking, the event itself is one to see and experience. What I’m trying to say here folks is this… As productive as the hatch can be, since the popularity has grown to what it has, wising up the fish to next level feeding disciplines… YOU HAVE TO BE ICEMAN TO GET IT DONE RIGHT! The earlier you book for the Hex, the less savvy those fish are, don’t wait till the first week of July to get in the book as many of those fish are well and wised up by that point, and even when feeding at an alarming rate, you will see them be as selective as a 8 year old boy at dinner… Trust me… I KNOW BOTH ENDS OF THAT! Last year we had some novice folks get some very nice fish based on incredible windows, so I’m not trying to deter anyone from booking the hatch as it is such a cool event, I just want our expectations lowered a bit more than we have had to in years passed when there was nobody fishing my beats with a boat, and fishing was truly silly by comparison to these days where you really earn your take. Gray Drakes is something I love to push because it’s a comparable hatch where I’m fishing as far as potential fish and you get to do it with lower light, but far from dark conditions. Fishing feed hard, consistently, and there are far more nights of good fishing throughout the whole river to be considered instead of getting stuck in a couple/few beats with everyone else. For my ELITE regulars… You’re always talking about stepping up for conditions as they land and getting a true shot a PM DONKEY… Well buck up and book The Hex! I’ve already put you guys through the grinder and could do things with that streamer/bobber/mouse cast with Hex I can do no other time of the year save knocking on the doors of the residents blindly… That’s putting you on a true trophy ON CUE! If you can’t tell folks… I’m a little pumped for the opener and all the water and fishing that comes with it. I’ve fished 5 rivers in the last week, and plan on a couple others this next week with the opener, and I really hope to get you folks out in the near future… Conditions are favorable this year for some of the best dry fly fishing we have as we are the third year from last lamprey treatment making for great bug counts in theory. Streamers till 21st of May sounds forecastable, Drakes by the 11th I’m guessing. Bigger stones just following with the Mother’s Day Hatch just already in play. Drakes should last till 2nd week of June, Hex Hatch usually starts about that same time and MOUSE FISHING IS GOOD TO GO FROM HERE ON OUT! Look for other Terrestrial & Trophy Mouse Fishing to start up around the end of the Hex in early to middle July, with the best in numbers during the dark side found early on, with the bigger fish often coming later in the season when food and water is scarce and the daytime feeding potential is down to poor with hunting almost impossible in the clear daytime waters. If you are bringing the younger generations up for their first experience with a fly, do consider the nymphing which is optional year round. They love watching the bobber, the cast is less strict, and if they do it long enough each day, there is always a handful of gold by the end of the day. Mixing up with a good drake finish is a great way to spend a day in May, and have productive fishing while learning. Watch your moons and peak weekends of summer when booking and do consider a Gray Drake trip this year. I’ve got the river dialed nicely over a dozen floats that offer great options with very few anglers around. … Give a call… Love to have you up… Posting my openings below…. Call for timing and techniques… Thanks Again Folks… See You Soon!